A lot of advertisers probably ask themselves this question when they are getting ready to buy advertising. The answer to this question depends on the advertisers budget and targeting requirements. Guaranteed click-throughs to your website are just that, guaranteed, while impressions have no guarantee. When you buy impressions (and all of your impressions are served), your campaign will stop running no matter how many clicks you received. Buying click-throughs is generally much more expensive than buying impressions because your ads run until all clicks are delivered. Discuss this article on 1800Webmasters.com You can come out ahead when buying impressions if you have an attractive ad, and are targeting a specific audience that would be interested in what you have to offer. Also, different ad-sizes receive higher click rates, so you should apply your impressions toward the best performing ad-sizes. On 1800Banners.com, we display statistics like (Avg. Clicks Per 1000 Impressions) by adsize for our advertisers to help them make this decision. We recommend that you buy impressions first, a small package of around 50,000. Once your campaign is complete, compare the amount of clicks you received and the cost of the impressions to our Click-Through Packages. A best way to see which advertising package is best for you is to buy one impression based package, and one click based. Now run two ad campaigns with same banner. Assign impressions to one and clicks to the other. At the end of the campaign, you will get your advertising results. 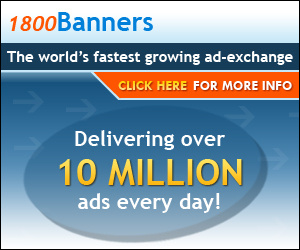 1800Banners is committed to protecting its publishers and advertisers. Should I buy clicks or impressions?